It’s 3:00am and most people in Tokyo are tucked up in their beds, fast asleep. But at Tsukiji Market, just around the corner from the city’s famous Ginza district, the mood couldn’t be more electric. Truck after truck pulls in, bringing loads of fresh fish, fruit and vegetables to one of the world’s biggest wholesale fish markets. This is a scene that has played out six days a week, for more than 80 years — but when today’s trucks leave, they won’t be coming back. The market is shutting down and relocating to a brand new, state-of-the-art facility. Once you get inside the coolrooms, where Tsukiji’s famed tuna auctions take place, the reality of this moment starts to dawn on everyone here. This will be the final mad-minute of auctioneering — some video it on their phones, others have brought their family members along to witness the historic scene. The bells ring — and they’re off. These tuna auctions attract everyone from Michelin-starred sushi chefs to corner store owners. It’s been the site of some record breaking sales too — in 2013 a 222 kilogram bluefin tuna sold for $1.7 million. Eighty-six-year-old sushi restaurant owner Shigeko Takahashi has been buying fish here for more than 70 years. The market was opened in 1935, replacing an earlier market that was destroyed in the Great Kanto Earthquake of 1923. “Old people like us just simply worked hard,” Ms Takahashi said. “There were no cardboard boxes — we worked very hard … [but] I don’t have any bad memories here. But the site is ageing. There are concerns about earthquake resistance, sanitation and fire safety, as well as asbestos in its crumbling walls. While it’s become one of Tokyo’s most famous tourist attractions — it was never designed for the number of tourists it receives. At its peak, it had around 40,000 visitors a day. While the now-closed inner market has been off-limits to the public since last week, the outer market will remain permanently open. But whether it will retain its culinary reputation remains to be seen. Ross and Jan Cox came from Brisbane to see why the area is so iconic. “I just saw somebody eating octopus on a stick, so that’s very Japanese,” Ross said. “It’s a really amazing feel about the place, so different to what it’s like in Australia. Not everyone is leaving Tsukiji Market happily. Last week, a few hundred protestors gathered outside Tsukiji to make their reluctance known, chanting that “Tsukiji was the best of all”. They held banners that said “Save the Tsukiji”. They’re upset for a range of reasons, ranging from the inaccessibility of the new site, through to soil contamination. The Government has spent more than $7.5 billion on preparing the new location, called Toyosu. It’s been the subject of great controversy in Tokyo, as it used to be an old gas plant and the soil had extremely high levels of cancer-causing chemicals. Tsukiji was originally scheduled to close in 2016, but the contamination at Toyosu meant the government had to spend an extra $50 million on extra clean-up work. Last month the site was declared safe and ready for business. Tai Yamaguchi has been running her family’s fish shop in Tsukiji for more than 50 years, and is fighting to keep her store there. “I don’t want to move. In fact, I don’t think we should move,” she said. “But the Government is strong and doing everything they can to make us move using obfuscation and lies — that said, even if we say don’t go, and remain here, that’s impossible too. In a last-ditch attempt to stall the relocation, 56 fish traders filed a lawsuit against Tokyo in September, calling for an injunction to halt the move, but it was ultimately unsuccessful. 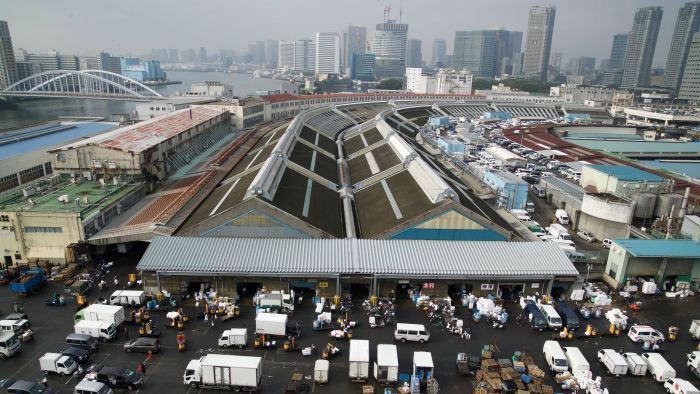 The Tsukiji site’s inner market will now be repurposed into a transport hub for the 2020 Olympic Games. After that it’s not entirely clear, but Tokyo’s Governor Yuriko Koike has said she wants it to retain Tsukiji’s reputation as a culinary centre.